West Michigan Family Stores/Grand Rapids ARC - Eric C.
My life was a constant lie. I had to cover up everything I did or said with another lie to hide the truth. I was miserable and constantly chasing after something that was killing me physically and spiritually. I was struggling with the decision of getting help for quite a long time, but kept pushing it off until I saw a video of myself when I was high. I was disgusted with what I saw. That is when I decided that it was time to get help and now. Since I have arrived here at The Salvation Army Adult Rehabilitation Center, I have started changing the way I was thinking, and found Jesus Christ. 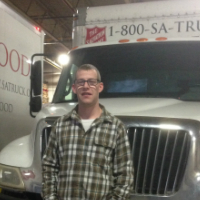 I have spent most of my work therapy as a truck helper meeting the donors and collecting donations. I enjoy my time on the trucks, because it gives me time to clear my head. It also gives me someone to talk to about my struggles with addiction. When I complete the six month program here at the ARC, I hope to restore my relationship with my family and keep making the correct decisions to provide for my family and myself.